You are what you eat. My wife has a dish that she loves that I fondly refer to as “crap pasta.” It’s comfort food from her childhood, a mixture of noodles, tomato soup and cheddar cheese. What’s your favorite weird food combo? International readers! Don’t be shy in placing your order for Book #2. The US dollar is still weak and depending on where you live, bargains can be had. For example you can get the standard edition with free signature and personalization for about 7 and a half pounds or about 10 euros. they’re chewy, they’re crunchy, they’re sweet, they’re salty, all at the same time. Definitely grapes and macaroni and cheese. Not separated though, mixed together. Nerutral cereals, strawberry jam, chcoco powder and milk. pb&j with potato chips was a favorite growing up, with or without bread. as a college student, its still a standby when i don’t have any bread around. currently i love a mix of cottage cheese and sour cream with various fruits and nuts and spices. however, i grew up eating a number of traditional ethnic foods which can be pretty weird. Being in college, I sometimes cook maccaroni, mix in mushroom soup, pork and beans, and maybe a slice of cheese. It’s weird. Fried eggs, put plain yellow mustard on top, and then chop it up with a fork…. It looks like vomit but tastes like…. heaven….. I put mayo on my fries once, being half asleep. Wasn’t bad – but I suppose you can put anything on fries. Salad Sandwiches. make a salad get a breadroll stick ’em together and you have a meal to go. Did I mention you can call it a sammich? White Rice, Tomato Soup, and Scrambled eggs with a lot of Salt and Sugar. Also when I make pizza I throw whatever edible (often expired) ingredients I have in my fridge on it. Like seaweed, (veggie) corndogs, mashed potatoes, and hard-boiled eggs to name a few. Chicken top ramen nuked to porridge consistency with some salsa & kraft sliced cheese. I call it vomit ramen. Bologna and cheese whiz, then I’ll stick it in the microwave for like 20 seconds. Cauliflower florets with rubbed with good-tasting nutritional yeast. Ugh. If I’m making grammatical mistakes that simple, it’s definitely time for bed. G’night. He doesn’t seem to like them. it’s not that weard but some times i have bin to indulge in a green tea flote. basicly ice cream in rilly hot green tea, and it’s not quite right if the ice cream is left too long and melts. Chicken nuggets (or fingers, whichever is available), dipped in frosties or pudding. First thing that came to mind? Pizza sandwiches. I make them out of the leftovers any time I make a pizza. Pizza sauce, whatever cheese I used, mushrooms, garlic, green peppers, and pepperoni on bread. Since when is the Euro the only other currency? During high school we were able to buy a cup of Nacho cheese with fries, I usually had a bit of the cheese left, which lead to the realization that Nacho cheese on Oreos is delicious. Also, wrapping a cheeseburger in a slice of pepperoni pizza is quite good. or tablespoon of cheese and onions. A little like Seraphine, I like a peanut butter sandwich with a bowl of chili or bean with bacon soup. As in, put the sandwich into the bowl, then pour the soup over it. Soupy bready peanutty goodness! ANYTHING with Ranch Dressing. Trust me on this, if it isn’t sweet or sugary, I’ve put ranch on it or plan to. Something about the flavor of Ranch, mixed into whatever I’m eating, just satisfies me in a way nothing else can. My childhood comfort food was condensed mushroom soup mixed with ground beef, served on hamburger buns. Until I was in my mid-twenties I thought this was normal “sloppy joes”. Aww mr_mop that was just an example. Some readers might not have realized that the exchange rate is in their favor. Pineapple rings on bagels. Those two foods were made to go together, I swear. The hole in the pineapple and the hole in the bagel line up perfectly. Ideal on camping trips: toast the bagel, roast the pineapple, slap them together and eat. If drinks count, then a glass of Dr. Pepper and milk is probably my weird food of choice. It’s not actually so weird when you think of ice cream floats, and it’s also pretty tasty. But if only solid food counts, then I like to cook some beef and rice, and crumble up cheez-its into the mix. Maybe add some onions sometimes. But yeah, the important thing is the cheez-its. Umm, I like to dip my peanut butter and jelly sandwitch into tomato soup if I have both at the same time. I couldn’t tell you why I like it. The flavors never mix and you always taste sech seperate food. I always liked cream cheese and jam on saltine crackers. It’s a nummy snack! chinese noodle soup with rice. Ok, not weird, but my family thinks it’s weird that I put rice in a dish that already has noodles in it. Peanut butter and american cheese has always been a favorite when I’m feeling down. Mmm, in fact, I think I’ll go make one now! Weirdest thing I ever ate was when I was a kid and my brother told me i’d get a dollar if I ate a sandwitch with one of everything from the fridge on it, from jelly and creamcheese, to all the deli meats and fruits combined. My favorite food is french fry po-boys(sandwiches), but it actually pretty common around here (here being southern Louisiana.) French fries + Beef gravy+ Mayo(on French bread)= messy deliciousness! one time i went to the cafeteria to get a salad, but they were out of crutons so i got a little…creative. i ended up with teriyaki chicken, spicy cheetos, nutrigrain, and raspberry vinigarette salad. i must say it was quite tasty, and best of all my friends didn’t try and mooch my lunch like they normally do (^^). Most likely it would be Ritz Crackers and Mini-marshmallows. It’s so good you make little sandwiches out of it and just eat’um. For some reason it just really good with sweet flavor and buttery flavor. By the way those look really hard to eat. Weird food combination? Never really had one, I just eat the food weirdly. Like raw ramen, easy mac with two chesse packets, frozen soda inside regular soda. Basically what you call “crap pasta” is your wife’s version of homemade spaghettios… mmmm skeddios no wonder its a childhood comfort food. I guess the weirdest food I make is the “dad’s meat sandwich” it’s only hard salami, spin blend “salad dressing” (not mayo, not miracle whip) and wheat bread… yeah not much to it, you think I would want it on white bread with some sort of vegetable or other meats and cheeses. And I guess its not that weird, but I guess I don’t eat much of weird combinations of foods. Ah, thank you psycho duck, you reminded me that I’ll put fries on my burgers, not onion rings though, I hate thosse. I’ll also put bacon on my hot dogs. I love a sandwich made with saurkraut on one side, mashed up pickled plum on the other (just a thin layer, mind you- that stuff’s strong!). In the middle we have rice and tempeh fried in a pesto sauce, and a few leaves of lettuce or cabbage. Ranch dressing? All the way. Especially with cucumbers. One of my friends just bought a bag of cucumbers and some ranch dressing after she ran out of munchies. So much awesomer than eating deep-fried calzones for … er .. late-Friday-night [adult swim] food. Mac & Cheese with mustard, and peanutbutter on hotdogs. 4 theme weeks in a row. Cornflakes and orange juice. Especially handy when no milk is around. Don’t have orange juice? so biff created an edible rocket in the previous page, and now he is eating them? ah the crazy genious of biff’s world. does everyone in biffs world make their own cereal? Hmm… Reese’s cups and watermelon is quite delicious. It’s not that odd, but I’m pretty sure nobody’s ever tried it before. However, when it comes to freaky food combos, no one holds a candle to my friend Mike. He has no sense of smell, and will eat just about ANYTHING. For a snack, I’ve seen him eat an oatmeal cream pie with an inch-thick slice of raw potato in the middle. Another time, he had a bowl of Chinese rice with hot sauce, ginger ale, and M&Ms. Burnt popcorn + Caramel jello pudding + Steak sauce + Hot sauce + Grape nuts + Peanut butter + A half-toasted waffle + Chocolate syrup + Parmesan cheese + Mustard + Barley + Chicken seasoning + Raspberry jam + Chocolate frozen yogurt + Ranch potato chips + Rice Krispie treat + American cheese + Pepperoni + Honey + Ketchup + Maple syrup + Milk + Popsicles + Diet Mountain Dew + Lemon juice +3 chicken taquitos. He gulped that sucker down without a second of hesitation. I stood amazed. 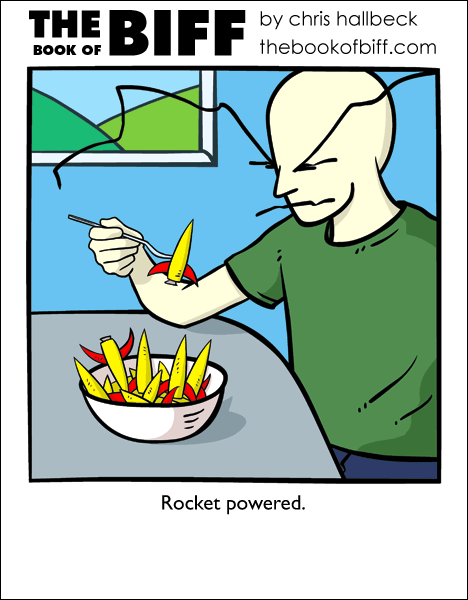 Oh.. so THAT’S what he did with the rocket from the last comic. mm, scrambled eggs with cream cheese in them. creamy, eggy, cheesy yumminess. when i was a kid i used to eat pb&j sandwiches with sweet or bread and butter pickles. i would also dip buttered toast in milk or hot chocolate. i still eat chips (any kind) on sandwiches, or make bagel and cream cheese and potato chip sandwiches. also, cheetos on pizza. celery and peanut butter. red vine straws to drink soda; just bite the ends off and stick in the can. azuki bean paste on toast. also, scrambled eggs with everything: persimmon, onion, pepper, salt, cheese, broccoli, apple, peas, carrots, salmon. whatever’s hanging around. Meatloaf with raisins, in a sandwich. I know I’m not the only one who does this, but I get lots of odd looks when people find out I’m eating meatloaf, in sandwich form, and that it has raisins in it. I think it’s the raisins that really confuse people, but there have been a number equally baffled that it was a sandwich. Another thing that people think is weird is I drink milk with everything. Chicken, salad, pasta, whatever. (I’ll admit it’s kind of weird to drink it with cereal…) The only thing I’ve found that it doesn’t go well with is Cranberries. Major ick. And I’ll eat bacon with just about anything. I had that dish today – we make it with macaroni and tomato sauce (and cheese). We tried it with tomato soup, but just plain tomato sauce tastes better. Dead simple fast and easy to make and just plain tasty. The first isn’t really a combination, but it’s still pretty weird. It’s just straight A-1 sauce. Tasty. The second is something that I bet at least one other person here has tried. Pretzel sticks and mustard. Don’t knock it till you’ve tried it. I love gherkins with spray cream on them. Oh, also another thing is fries dipped into mint choc chip ice cream. It’s absolutely AMAZING. One of my friends swears by noodles with mayonnaise, but I tried it once and it was absolutely rancid. The smell was bad enough, but I figured I shouldn’t knock it without trying it. I immediately regretted it. Pizza omelets. Nothing like egg filled with pepperonis, mozzarella cheese, tomato sauce, and green peppers (speaking of which, pepperoni and green pepper pizza is amazing). Oh, and I also like a fried potato sandwich – ordinary skillet fried potatoes (made with onions natch) on two pieces of buttered toast. Great for finishing off any leftover potatoes. Weirdest food combination that I ever ate? Evreything to make mcdonalds burger! If ddrinks count, I used to put chocolate milk and goldfish crackers in a cup, let the crackers get soggy, and gulp it down. It was awsome.Weordest food though, probably Monster Sandwich: Tuna, salami, turkey, ham, corned beef if I have it, American cheese, chedder cheese, swiss cheese, pepper Jack, provolone, mozerella, mustard, ketchup, barbeque sauce, hot sauce, steak sauce, relish, onions if I have them, Mayo, potato chips (The chedder and sour cream kind), olives (pimentos), and all between two peices of toasted sourdough bread. Other names for this disaster : Gut gernade, Colon cannon, Bathroom breaker, Edible endevor, Death wish, and Last words. Peanutbutter and cheese sandwiches. Think I picked it up from my dad, although I don’t think I’ve ever actually seen him eat one. Weird? I eat pizza with green onions, but that’s about it. honey, banana and crushed buiscuit sandwiches. @Radical Edward: how can you get green onions? mouldy? Chips on burgers, sammiches, and in wraps. I also like to eat tuna salad with chips. Potato chips that is–and the kettle type are the best. Uh, I also like mayo sammiches, except I use miracle whip. And yes, on plain white bread. Mmmm, white bread. Hella trashy, though, are hotdawgs straight out of the packing with mustard. french fries and ranch dip. ‘s pretty good. Juicy fruit gum and human blood. Seriously. Cinnimon twists (From Taco Bell) and nacho cheese. It’s a lot better than you’d think. Baby corn and butterscotch pudding. It sounds disgusting, but it has a nice flavor and crunch. Hot dogs with crunchy peanut butter. I used to own a hot dog shop, and some customers suggested it one day. It took me 2 weeks to build up the courage to try it, and found it was actually really god. I started selling it and the majority of customers who tried it found it worked for them as well. The only stipulation I will point out is this: the hot dog has to be grilled. If you boil it, microwave it, or whatever else you would use, it just doesn’t work. but if you grill a hot dog and put a little bit of crunchy peanut butter on it, you’ll agree. And if you want to take my own variant, try adding some honey on that as well. Peanut butter and cheese. Any sort of cheese, really. Don’t knock it ’til you try it. My friend had entered a young chef competition in which I’d offered to be her helper. She had to cook a main course and a dessert. She ended up with left overs, and dared me to dip a carrot in cream. Actually not a fantastic mix really. Hula Hoops and Marmite work well though. It was another dare, we’d sat down at the table with crisps and saw a jar of Marmite in front of us. Technically its not that weird, but thought I’d say it anyway. A peanut butter, jelly, and Flaming Hot Cheetoh sandwich. I call it the napalm sandwich because it’s sticky and it burns. I put scrambled eggs on my hot dogs. I’ve had week of late nights thus far trying to make it through, but I jut had to stop and comment for this one. Yay!! I’m not the only one that likes pickles and whipped cream! I also had mad cravings for jello and red onions when I was with child. Also, i recently got into packaged ramen. not weird, but im used to restaurant home-made stuff. im not asian, if that means anything, im 50% german, 50% mutt, 100 % american against the govt. they’re out to get you. I figured you weren’t Asian. No self-respecting Asian would eat Ramen. Cream cheese and strawberry jam burritos. Mmmm, good. I’ll eat cottage cheese with olives piled on about 5 slices of pizza which in turn is sitting on a big mess of mac ‘n cheese, spaghetti, and other various pastas, with a side of mushrooms, salad, eggs, more cheese, and a big glass of tomato juice. Sometimes with a foot long sub. 2) how can I eat all that 3 times a day and still be 140 pounds. My friends and I used to have “salad parties” at school as an alternative to the normal pizza-chips-cookies-soda potlucks. In my opinion salads exist as an excuse to eat other things while making your concience believe you’ve just consumed something healthy, and we took it to the extreme. Anything in our refridgerators was fair game, including any varieties of meat, cheese, nuts, fruits, cookies, sauces, pasta chicken egg tuna and potato salads, vegetables, crackers, olives, breads, and condiments we could get our hands on, just as long as there was at least Italian dressing on hand to pour all over it. My favorite salad of all time contained leftover London broil, edamame, pine nuts, blue cheese, provolone, salami, a handful of other things I have forgotten about, and Asian sesame dressing. In lieu of all this not-so-healthy goodness, a restaurant side salad with blue cheese or ranch dressing should not be consumed without being covered in crunched up saltine crackers. A Penut-butter & omlette sandwich 😀 CHOLESTEROL FTW! Fried eggs with salsa and cheese. In college I’d eat pepperoni cheddar cheese and ranch dressing sandwiches. I have two, peanut butter and olives, and grapes and cheese. If you think that’s gross, then don’t talk to my sister, miss peanut butter, jelly, bolonga, and cheese sandwiches. I lost my appetite when I saw her eat three… ech. I really, really like blueberry bagels with tuna, cheese, and mustard. My brother used to eat apple sauce mixed with ketchup on slices of bread. A friend once dared me to eat a peanut butter and tuna salad sandwich. It wasn’t bad, just very salty. My best friend in college ate pickles with yogurt. I don’t have anything to top that. Ice Cream on saltine crackers. My Grandma, who worked in an ice cream parlor as a teen, turned me on to that, or a bowl of ranch with half a bag of chedder cheese stired in. Chicken, rice, corn, and ranch dressing. Waffles and caviar. Lovely lovely food. Weirdly enough the “crap pasta” is EXACTLY what I tend to go to as a comfort food too. Macaroni, tomato soup (usually Campbell’s) and cheddar cheese. Mmmmmm. Not exactly a balanced diet, but good stuff all the same. That or the same thing but with cream of mushroom instead of tomato. Ghetto mac and cheese. Still miles better than the Kraft boxes though! I’m totally bookmarking this page so I can come back and try some of these… ‘foods’ people apparently eat and enjoy. Peanut Butter and Honey Sammich, eaten with Hot Chocolate. Take a PB & Honey sammich or two (some people think that alone is odd), and a cup of hot chocolate. Dunk the sammich in the drink (like one might do with oreos and milk) and eat. Peanut Butter and Tomato Sauce Club sammich. Toast 2 pieces of bread, butter them and add Peanut butter and tomato sauce. Put an untoasted piece between them and eat. I swear, I’m not making this up. I have eaten this since I was in high-school (many years ago). The only other thing I eat that’s odd may be hard for people to picture, as the ingredients are unfamiliar. Weet-Bix and Marmite + sugar. Take weet-bix (adjust brand name to regional), and spread on as much Marmite (Vegemite can go die in a fire) as you dare. Personally, I like it, so it goes on fairly thick. Do this to 3-ish of them, and lob them in a bowl, and pour in milk, then sprinkle some sugar over the lot, and ‘enjoy’. For those that haven’t enjoyed the experience, Marmite is effectively black salty death. It’s potent. And salty. One of my cousins would only eat a few select foods when we were kids. Once we had a very interesting snack of Oreos & Goldfish crackers together in the same bowl, while drinking orange juice. I’ve actually thought about trying it again recently. My cousin used to dunk her chicken nuggets from Wendy’s into her “frosty” (soft-serve ice cream in a soda/pop/cola cup, essentially, for those of you who don’t know). Ramen noodles for me. I love them to death. One drawback, I refuse to eat them without lemon juice, hot sauce, crushed red peppers, ground red peppers, basil, garlic powder, and half of the bag of seasoning that comes with the noodles. Then there are the other five or so spices that I use to vary the flavor. Yummy noodle time! Pizza, with anchovies and fried shrimp. My step-dad eats Ham, Jam, Tuna, Cheese and Brown sauce on toast. I personally prefer marmite and fries or maybe fries dipped in coke. my comfort food is crackers. my best friend argues with me and tells me its ice cream. no. that is my favorite food but not a comfort food. theres a diffrence. my fav is Town House crackers. mmmm. now i have to see if we have any….